A thundering week in Orlando! 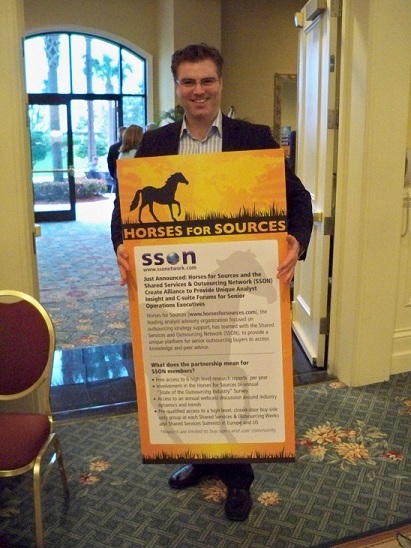 Thanks for all of you who helped support the first "public" appearance of the Horses for Sources research organization in the lovely Orlando last week for SSON's "Shared Services and Outsourcing Week" event, which achieved over 900 delegates. (And yes, I was symbolically middle-seated on my journey home...). Our "Thundering Hooves" session, which was based on the Family Fued game show (Family Fortunes in the UK) was highly entertaining and we're excited to stage this again (with real sound effects) in Edinburgh in May. Thanks to Lee Coulter (HfS), Deborah Kops (WNS), Tiger (Genpact), Graham Russell (Astrazeneca), Jay Desai (Northern Trust), Rick Arpin (MGM Mirage), Joe Hogan (Alsbridge) and Mike Fraley (Everest Group) for being good sports. And a special thanks to Emma Beaumont and Sarah Clayton at SSON for making this happen. Now who, on earth, is this grinning idiot?